2.1 Obesity quiz: How much do you know? 2.6 What's needed for healthy weight loss? 3.1 What can physiotherapists do to help? 3.3 What's available for weight loss in your practice area? 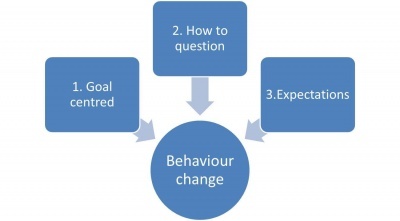 4.1 What is behaviour change? 4.3 What is important? What to include and be aware about? 4.4 How can this intervention be used with obese and overweight patients? 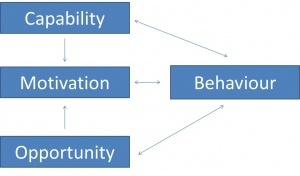 5 How can communication be used to facilitate behaviour change? 6 What words to use when addressing excess weight with patients? This learning resource has been produced by a group of 4th year Physiotherapy students from Queen Margaret University, Edinburgh. It has been designed to give a deeper insight in the complexity of obesity, the role of the physiotherapist and offer communication approaches to address this issue. Physiotherapists have an important role in encouraging individuals to increase their levels of physical activity and give advice on having a healthy diet. Obesity can be seen in a musculoskeletal clinic where, for example, knee pain could be exacerbated or in a medical ward where a patient's diabetes may be poorly managed. Despite the various health care professions’ efforts to tackle the issue, obesity is still on the rise and considered a global epidemic. A reason for this could be that underlying causes of obesity and overweight may not have been fully taken into account in previous interventions. This resource identifies three major contributing factors to obesity and overweight that need to be considered. Communication is a huge part of tackling obesity, however, junior physiotherapists and newly graduates may find this a challenging subject to approach. Therefore, this resource will also look at how communication approaches (in particular motivational interviewing) could allow physiotherapists to facilitate behaviour change with patients who are struggling with this issue. The wiki will take approximately 10 hours to complete. This learning resource can be used for individual study and therefore included as part of your Continuing Professional Development (CPD). The aim of this online resource is to provide final year physiotherapy students and newly qualified physiotherapy graduates with an online learning resource which aims to develop their knowledge and understanding of physiotherapy management approaches for people with overweight and obesity. 1. Explain and describe some of the key factors contributing obesity and to patients being overweight and critically evaluate how these factors impact physiotherapy practice. 2. Appraise the relevant evidence to identify and summarise the role of physiotherapy in management and treatment of obese or overweight patients. 3. Critically evaluate the theories and evidence base for communication approaches to facilitate behaviour change in people with overweight and obesity issues. However, the learning activities in this resource will involve a range of skills and knowledge to be demonstrated by the reader. The activities will be signposted by blue or orange banners. Obesity quiz: How much do you know? "Obesity and overweight are defined as "abnormal or excessive fat accumulation that may impair health". 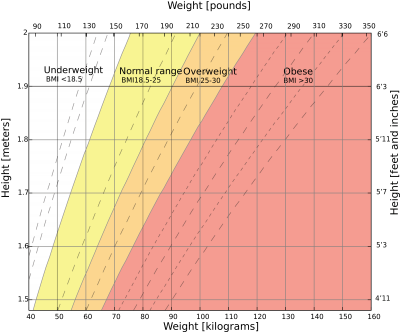 The World Health Organization defines levels of obesity and overweight through the Body Mass Index (BMI) scale. The following diagrams illustrate how the BMI scale is used to classify weight and levels of body fat. There are many implications of obesity worldwide. Obesity increases the risk of many long-term health conditions such as Type 2 diabetes, heart disease, arthritis, hypertension, cancer, stroke, liver problems, respiratory problems, sleep issues, mental health disorders and, overall, may cause a reduced quality of life. People with obesity also have an increased risk of falls. With the rising obesity epidemic and reduced staffing, funding and resourcing within the NHS, the demands on the health service will increase. This could ultimately lead to reduced quantity and quality of care. Obesity also contributes to wider financial problems such as more increasing cost of welfare support and loss of output within the economy. Obese patients who have been affected by an injury or have undergone surgery have an increased recovery period. This results in an increased length of hospital stay which adds more pressure on the health service due the increased demand for hospital beds. Obesity places further pressures upon the NHS’s resources with the increase use of and demand for bariatric equipment. Obesity contributes to many deaths and illnesses worldwide, which could otherwise have been prevented. The prevalence of obese people is more than 50% since 1980. Obesity is the 5th indicating mortality factor in the world. Amongst developed countries, the UK has one of the highest instances of obesity in its population- ranking 3rd worldwide. In Scotland, amongst adults aged between 16-64 years in 1995, 17% of these were defined as being obese, whereas in 2010, this percentage had increased to 27%. In addition, a further 38% were defined as ‘overweight’. This means that, in 2010, 65% of adults of age 16 or over were either overweight or obese. In 2007-2008 the predicted cost was £175 million to the NHS in Scotland alone due to obesity and associated diseases. There are many different contributing factors to obesity. Amongst all the possible contributing factors, research highlights the following three main factors that contribute to obesity. These three factors are prevalent within physiotherapy practice causing an increased demand for physiotherapy intervention. Due to the high prevalence of these factors amongst overweight people, it is essential to take these factors into consideration when carrying out physiotherapy assessments, and when problem lists and treatment plans are being formulated. For example, this might include a higher level of awareness of how to communicate with these patients. Socio-economic status is a large factor influencing obesity. In a study conducted in 2009, of 12,000 children and teenagers aged between 2 – 19 years, levels of high obesity were around 1.7 times greater in those from a deprived area, than those in a non-deprived area. Socioeconomic status refers to a person’s position compared to other people’s personalities, this has contributed to putting people into certain categories allowing evaluation of discrimination between these public categories. They also illustrate that unhealthier foods are less expensive and more instantly available within deprived areas. Overall, a huge factor contributing to obesity is the economic status of people and the type of environment they live in. The MRC National Survey of Health and Development showed that BMI was directly connected with educational success in both sexes. Highest obesity levels were found in people with the least academic achievements. 11% of men with O-grade level achievements had a BMI above 30, whereas, only 5% of men’s BMI were over 30 when they were at degree level of attainment. The same result showed within females as well- correspondingly 15% and 4%. The evidence and guidelines explain this is a large contributing factor to obesity. By recognising this problem at the beginning of physiotherapy interventions, physiotherapists will be able to adapt their approaches to become more relevant to the individual’s circumstances. Physiotherapists can also assist in giving the individual advice or guidance if certain socio-economic factors are contributing to obesity. There is a lack of research in establishing a definite cause-and-effect relationship between obesity and mental health disorders (such as depression and anxiety). 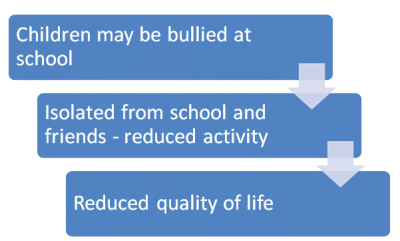 However, it has been observed that a link could exist between these variables and individuals, meaning they more vulnerable to mental health issues and obesity. 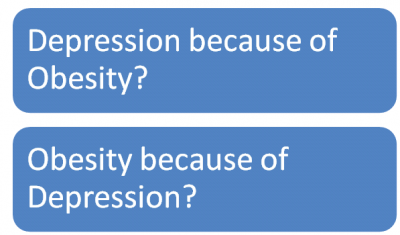 The Obesity Action Coalition states that it is thought that the two could be strongly linked or that they at least co-exist, however it has not been established which one comes first- for example whether obesity increases onset of developing depression, or having depression increases the chances of developing obesity. What do you think from your own clinical experience? Depression, in most cases, can be quite debilitating, therefore decreasing an individual’s motivation to take part in exercise or other physical or social activities. Depression can also result in a person believing they should not be taking care of themselves, and so may not follow a healthy well-balanced diet. These factors can lead to increased chances of developing obesity. A systematic review and meta-analysis on the longitudinal relationship between depression and overweight and obese patients was conducted by Luppino. It was observed that obesity did increase the onset of depression. Another study by Bogart showed that, in America, 50% of women with a BMI > 30kg/m2 developed depression over their lifetime, however, these results were not replicated with men. This might be due to higher sensitivity levels that women have and the stigma the media conveys about small sizes and beauty. However, it is important to consider that a person with underlying mental issues may have increased body weight due to the type of medications they are receiving. A study supported a strong link between schizophrenia and depression and obesity, where results showed that metabolic risk factors can almost be double in those suffering from schizophrenia. Taking more time in therapy sessions combined with allowing the person to have a chance to speak gives the person to feel more relaxed in the surroundings and allows the therapist a chance to fully understand the main presenting problems. Personal space can be important if a patient is anxious and uncomfortable. Trust is essential to the patient- physiotherapist relationship. An example of how a therapist could build this up in an initial assessment is to spend one session doing the subjective part, then explaining for the next appointment what exactly the objective assessment will entail (e.g. exposing a certain body part). This will put patients more at ease. Obesity is a higly heritable trait- even more so than depression and hypertension. A rare genetic condition that is a contributing factor to obesity is Prader-Willi syndrome, where children are much more likely to overeat. Pairing this with a decreased metabolism and lack of muscle tone, they have an increased risk of being obese. This condition occurs when there is a defect in chromosome number 15, and the prevalence is no more than 1 in 15,000 children. Apart from this genetic defect, hereditary factors from mothers to new-borns are found to also contribute to obesity. It is found that BMI and waist circumference trends are highly heritable, estimated to be ranging from 40- 70% in chance. Genetic influences (combined with family influences such as parental discipline and example), can play a huge part in why a person can present with obesity or excess weight. Physiotherapists will need to be aware that these may impact the opportunities a person has to change or modify their behaviour, and will need to manage them accordingly. For example, when setting goals with patients, the physiotherapist can try to explore and emphasize what adaptations can be made instead of focusing on barriers to changing other areas. Overall, by a physiotherapist recognizing and being aware of these contributing factors, physiotherapy approaches can be adapted to specifically benefit overweight and obese patients. Having physiotherapy management that is sensitive to these contributing factors can improve outcomes, as the interventions included will be specific to the individual and relevant to their current personal situation. The role of the physiotherapist includes advice, guidance and behavioural change (more information about this will be included later on in this resource). Are there any small adaptations you could make to your clinical practice when treating a patient with overweight or obesity and any of these contributing factors? What's needed for healthy weight loss? It is essential to know the recommendations for healthy weight loss to provide the right advice to obese and overweight clients. What can physiotherapists do to help? (From the Chartered Society of Physiotherapy ). Physiotherapists, throughout their careers, will come across patients with overweight or obesity issues. As mentioned above in section 2.4, a large proportion of the Scottish population are obese or overweight, and this will also include a large proportion of physiotherapy patients. Obesity can mean that a person is more likely to develop physiotherapy- related issues, such as osteoarthritis and restricted movement at some joints leading to functional limitation and pain. Physiotherapists often treat clients that suffer from secondary conditions due to their obesity or excess weight. An interesting analysis was made by the Canadian Joint Replacement Registry, where they found that 73% of hip replacement patients and 87% of knee replacement patients were classified as overweight or obese at the time of their surgery. Physiotherapists are aware of the treatment for these conditions, but there is little research describing the physiotherapist’s role in managing the individual’s weight as an underlying problem that is associated with their joint replacement. Co-ordination of comprehensive and sustainable programmes of management in collaboration with service users, community service and other health and social care professionals. Overall, physiotherapists have a huge role in managing obese and overweight patients, through using a combination of exercise interventions, mobility training and cardiorespiratory programmes; and also through the use of effective communication techniques involving behaviour change. Behaviour change will be discussed in more depth further on in this resource (see section 4). Despite having ideal knowledge and skills to combat obesity, many physiotherapists do not feel that it is their responsibility to include behaviour change interventions in their practice. Others feel they do not have the required skills to undertake this approach, or are fearful to do so for lack of confidence; as many have not have received the appropriate training to establish effective communication with patients in promoting healthy lifestyle changes. The lack of knowledge and training for physiotherapists in how to approach the subject of weight with their patients is identified as one of the barriers that can limit the proper care of obesity. There is an increasing amount of evidence showing that obesity is a multidisciplinary issue and should be addressed by all health care professionals. Alexander et al. stated that it is important for health care professionals to be involved in the early stages of treatment of an obese individual. Physiotherapists may be the first contact for these clients who might present with various health issues due to their increased weight. NICE guidelines support this by specifying that this type of intervention would be best supported and carried out by a health care professional. This means that even though health care professionals find that they have many time, knowledge and resource constraints in their practice, tackling the issue of overweight and obesity is something that should be included, if not prioritized, in both multi-disciplinary and individual healthcare interventions. This can be achieved with adequate reassurance and support to practicioners. Setchell et al. identified ways that physiotherapists could attempt to make patients less uncomfortable when discussing this issue. ⦁ Not ignoring or overemphasizing the topic of weight, but being non-judgemental when discussing it. The Knowledge and Skills Framework (KSF) model is used in the UK by Band 5 physiotherapists, to assist them in providing “a comprehensive physiotherapy service, which encompasses assessment, treatment and management” of patients in a wide range of settings. The KSF is a helpful tool which demonstrates what abilities health professionals should have to fulfil their specified role. It contains a number of core dimensions such as 'Communication' and 'Equality & Diversity', as well as dimensions specific to physiotherapy: 'Assessment and Treatment Planning' or 'Interventions and Treatments'. Band 5 physiotherapists will need to complete these indicators as best possible with all types of patients, including those who may be obese or overweight. Obese and overweight patients have specific additional risks and implications to health care (see sections 2.3 and 2.4). 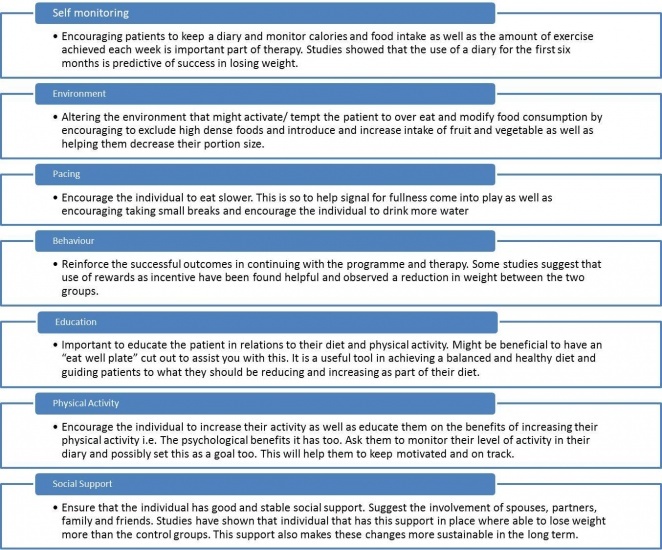 Some factors physiotherapists may have to consider when treating obese/ overweight patients in relation to the specific dimension ‘Assessment and Treatment Planning’ are outlined below as an example of how the KSF model can help guide physiotherapy treatments. Take a few minutes to think about what you would do to fulfil each of the following indicators in the table below. This resource's suggestions will be found in a table at the bottom of this web page (see section 9). What's available for weight loss in your practice area? Think about what’s available for weight loss in the community you work in. Are there any activities/ organisations you can recommend or refer your patients to? Through the GP Referral Scheme in West Lothian, healthcare practitioners can refer their patients to the 1st STEPs to health and wellbeing programme (STEPs = Supported Targeted Exercise Programme) provided by some gyms in West Lothian. This referral system can be used for patients who are too well to require ongoing physiotherapy, but it can give these people a place to continue exercising and building up exercise tolerance, whilst being supported to self-monitor their own progress. Follow-up of weight loss interventions has been shown to be beneficial for both physiological and psychological health, even though much more research is required to determine the intensity and how long follow-ups should extend for. Finding out what is available locally can be a great resource for patients who want to lose weight. There are a number of guidelines and recommendations available for the use of physiotherapists and other health professionals when working with people who are obese or overweight. The SIGN guidelines are a good reference for health professionals to use when planning advice and treatments (see section 2.6). 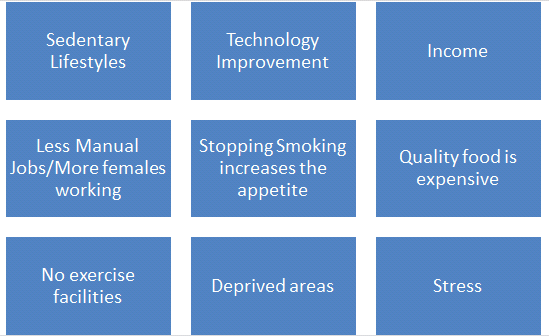 Interventions that include behavioural change are complex, designed to target and change a specific behavioural pattern and are put in place to promote a healthier lifestyle. This type of intervention is most effective when used for a long duration and in intense sessions, as well as being used alongside other interventions (like prescription of medication). An important characteristic of behavioural therapy intervention is that it adopts a non-critical and non-confrontational approach, but uses a collaborative approach instead. This means that the physiotherapist and the patient work as a team, facilitating lifestyle changes as well as equipping the individual to maintain and self-manage their weight post-intervention. Many research papers highlight that one of the main difficulties in the process of losing weight is maintaining weight loss in the long term. The research available in regards to follow-ups past one year is limited, however there has been a recent study undertaken by Action for Health in Diabetes looking at long term effects of incorporating behaviour change as part of the intervention with patients with Type 2 diabetes. The intensive lifestyle group received advice on diet modification and physical activity; and behavioural strategies such as goal setting, self-monitoring and problem solving were addressed. The diabetes support education group participants were not presented with any behavioural change support but were only given general focus on diet and physical activity. It was observed that there was a greater weight loss in the intensive lifestyle group compared with the other, meaning that behavioural change interventions can be effective amongst obese and overweight individuals. This is especially true in the long term as it equips patients with essential tools to be able to make healthier lifestyle choices and changes. The study did not specify whether patients suffered from any mental health issues or from a low income, however the results can still be applicable to such population yet keeping in mind of the difficulties in changing external factors that could contribute to obesity. What is important? What to include and be aware about? 1. Goals need to be designed in a manner that is specific to the patient and measurable. Many studies and articles highlight the importance of physical activity and the recommendations for exercise to aid weight loss. Common fears and misunderstood perceptions overweight people may have in regards to physical activity can sometimes prevent them from being active. Therefore, it is important as health care professionals to address these expectations, and by doing so aim to alter patients' behaviours towards exercise. One way to do this is by creating patient-centered goals. Goal setting should be discussed with the individual and should be realistic. Findings show that overly-optimistic goals might lead to failure and disappointment, leading to patients becoming more demotivated in regards to exercise. Setting goals is an extremely important part of this type of intervention, as they can motivate and encourage patients to be fully on board, and give them visible goals to achieve, which they can look back and reflect on. Setting small yet achievable changes is very important. 2. It address in depth the question “but how?”. This type of intervention does not just address what to change, but more importantly helps those individuals identify how to change. This means that the physiotherapist can act as a facilitator in the process – once a goal is agreed, the patient should be encouraged to examine what factors might either facilitate or hinder achieving the agreed goals. 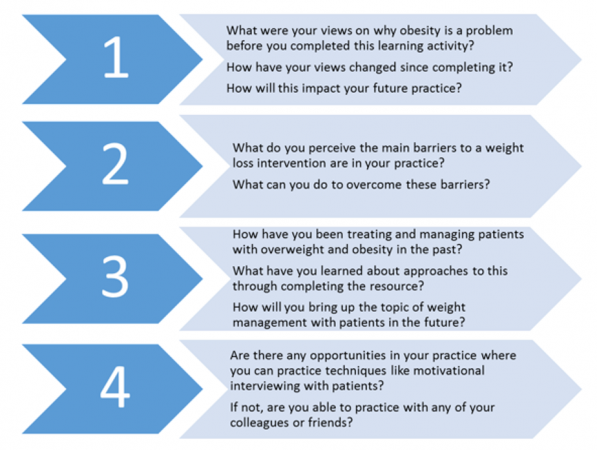 New strategies, responses and skills are discussed and taught in order to overcome any barriers that might be faced during the patient’s weight loss journey. Foster et al. states that is not a matter of will power that will lead to success but it is “skill power”. 3. Another important aspect to discuss are patients expectations. Behaviour changes should be small rather than large- this is also to avoid failure or disappointment. It is important to ensure that incremental steps are made, and that the patient fully understands that the process may be slow. Patients should also be able to understand the benefits of setting small changes which they can build on, instead of attempting drastic changes that might only be short-lived. This process is important to ensure that patients are equipped to maintain a healthy lifestyle and manage their own weight in a healthy manner. It is also important to establish what the individual is capable to sustain in the long term so to prevent any relapse or re-gained weight. How can this intervention be used with obese and overweight patients? Information and advice on healthier eating and lifestyles have gradually increased and are now widely accessible. So, why do people struggle to put this in to practice despite being aware of the benefits of increasing physical activity and improve their diet? 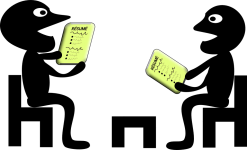 Interestingly enough, a study showed that being aware of these required changes did not automatically translate or bring the individuals to take any measure of change in their behaviour, allowing us to raise the issues as to whether people have become so overloaded with such health information that might be in “danger” of switching off. However, many professionals still think that the primary and most effective tool is providing the patient with advice and education. Although educating the patient can be very useful, most overweight patients are often already aware of what they should or should not eat and the benefits of physical activity. In those cases, being willing and taking time instead to explore barriers to weight loss might be more effective rather than wanting to ‘fix’ the problem. This will allow the therapist to explore the reasons behind the person’s behaviour and lifestyle choices, trying to skillfully identify any activities or circumstances that encourage or stimulate unhealthy habits/balance. In this resource, we have looked at the three most relevant barriers (see section 2.5). As you have previously read, mental health issues are growing in the current population and they can be a real hinderance and struggle for people and there is evidence supporting that mental health and obesity could be linked. In the US Diabetes Prevention Program, greater readiness for change in physical activity level, higher exercise self-efficacy, and lower perceived stress, depression, and anxiety scores were linked with higher levels of baseline activity and maintenance of activity levels at 1 year and at the end of the study. These findings show that the individual’s initial psychological well-being might play a crucial part in predicting whether the individual will adhere to changes or not, and it is unlikely that someone with poor psychological well-being will have the ability or the energy available to take those steps toward behaviour change. Poor psychological well-being might also impact and decrease the individual’s confidence and self- efficacy. Therefore, it comes with no surprise that such changes are difficult and require time as well as support. It is important for therapists to keep this in mind when delivering this type of intervention and undertaking assessments of the readiness levels of the patient, as it might help determine which patients are most likely to increase physical activity levels in lifestyle intervention programs. 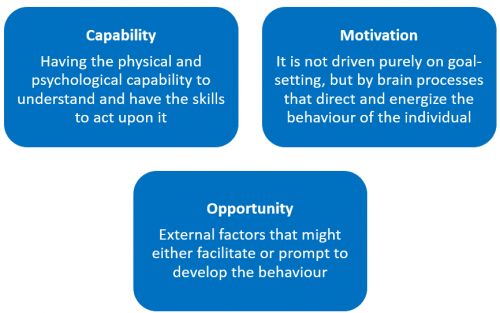 This theory model explores three aspects that are key for any behaviour change to take place, those are: capability, opportunity and motivation. It is said that for certain behaviour to occur the individual must have knowledge as well as the physical and mental capability to act upon it, be motivated to do so and be clear how to achieve the change. 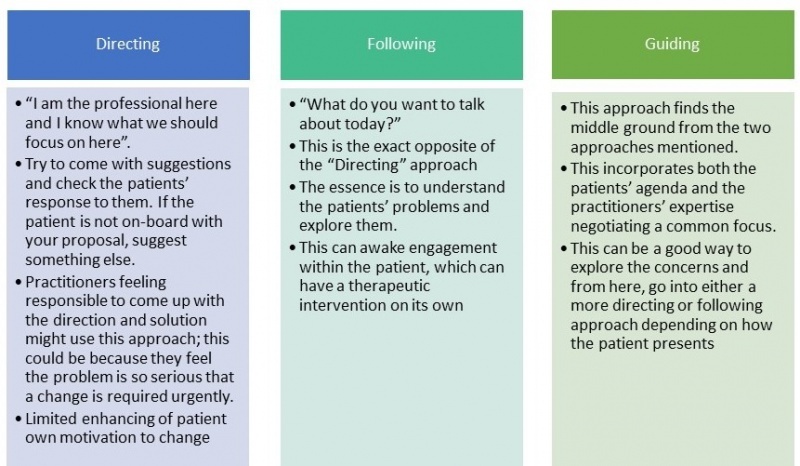 It is useful to be aware of this model when trying to design an intervention or when initiating the difficult conversation, so as to be able to explore and engage the level of readiness the individual is at, and to assist physiotherapists in creating an intervention that can target one or more of these processes, and be patient centered. Most individuals have either been told by a GP or by their family and friends about their weight, and some of them will have expressed a desire in regards to change (or at least thought about it). This demonstrates one of the COM-b model process- capability. They see the benefits of decreasing their weight, but also the barriers stopping them. Ambivalent means both wanting and also not wanting to change at the same time, and it is a common place to be stuck. A common pattern is to start to think of change, then start to think of a reason not to do it and then just stop thinking about it. The way out of this is to go with one path and stick to it. This is something to be aware of when communication with patients as it is easy to present only the benefits losing weight and try to fix the patient, also called “the righting reflex”. What might happened is that the person start to voice the other side of the argument and justify why they have not done the change yet and responds with denial and oppositional-like behavior. Exactly the opposite of what we are looking for! Try this thought experiment, or do it with a friend. And gives you encouragement to do it. 2. How are you likely to respond? 3. Again, discuss something you want to change in your life, something you are ambivalent about. However, this time the friend is not going to argue why you should change, but instead ask a series of questions and listen to what you have to say. What are your top three reasons to do it? How important is it for you to make this change, why? So, what do you think you will do? 4. How do you feel after this approach? How can communication be used to facilitate behaviour change? "Motivational interviewing is a person-centered counselling style for addressing the common problem of ambivalence about change"
As previously mentioned, engaging is the process where a mutually trusting and functional working relationship is established. Even before patients attend physiotherapy, they will have wondered about how they will be treated and what the practitioner will be like. First impressions do leave a significant mark; on the other hand, it is not unchangeable. During the first visit the patient will decide how much they like and trust the practitioner and if they will come back. The importance of a good dialogue between practitioner and patient cannot be stressed enough as it has major impact on the patient's attitudes in relation to managing weight. A study from 2014 found that patients who felt judged about their weight by their primary care providers reported lower trust in their health practitioner compared to others. With this in mind, it is suggested that first addressing the reason the patient is coming in for is good practice, in order to build a good relationship and enhance patient-centred practice. It is important to address the patient with an empathetic and non-judgemental approach, trying to separate the weight problem from the person. The patient might be vulnerable and frustrated from previous attempts to lose weight and be quite sensitive to discussing this problem, however this should not be a reason for the practitioner to shy away from the problem and bring up the implications of being overweight. To know where the physiotherapist is going with the MI intervention there must be a focus; i.e. what did the person come to talk about? However, the practitioner might also have an agenda that is linked to the original problem. For example, the patient being treated might be complaining of low back pain or a bad knee, in addition, the same person has a BMI of 35kg/m2. The practitioner should address the patient complaint but should also consider bringing up the possible contributing factors to this problem. By doing so the practitioner gets a better picture of the patients’ knowledge, self-awareness and readiness to change. Normally the main source to the focus of the problem. If the practitioner is confident and competent to help the patient with the concern they are presenting the focus is set. If the setting is a weight management clinic, this will influence the focus of the conversation. What to be aware of is that this can limit the context as the setting predetermines it and makes it harder to raise other issues that may arise. Often, the patient will arrive at an appointment with one goal in mind, while the physiotherapist perceives that another kind of interaction is needed. The physiotherapist will need to investigate the patients’ willingness and readiness to discuss this other issue. Maybe it relates to their initial goal and may help them achieve that. An obese person turns up to his physiotherapy appointment because he has lower-back pain. The physiotherapist wants to discuss weight issues with him.The patient may or may not recognize the relationship between the two. The hope of the physiotherapist is that the patient is going to recognise the relationship between the two which will increase his motivation to make a change. In this video the practitioner raises the issue with the patient with high blood pressure. See if you can recognize the "following" communication style the practioner is using to explore the weight problem further. This stage is the "tipping point" of the process. The patient starts to realise that the pros outweigh the cons which again is the core of MI, i.e. resolving the persons’ ambivalence and make them commit to change. This stage emphasises the importance of the interviewer to promote this “change talk” in the patient. "I really want to get fitter"
"I am not happy about my current weight and want to change this"
"I miss being able to go for a run without being out of breath after 2 minutes"
By reflecting and exploring these responses, the physiotherapist reinforces the patient's statements and enhances the patient's motivation for change. O: use open-ended questions instead of closed questions as they will help to explore more in depth the patient’s feelings and views regarding their weight. Watch this video where the O.A.R.S concept is explained in more depth. The D.A.R.N is preparatory, while the C.A.T is required for moving from general intention of wanting the change to actually doing something about it. When designing a plan, it is important to have the patient's fullest possible co-operation to avoid them falling back to being ambivalent. The planning process builds on the same principles as the previous stages; i.e. collaborative spirit, O.A.R.S strategy and a clear direction towards change. MI was found to reduce BMI and weight in overweight and obese adults in a Cochrain review from 2012 . Previous evidence also indicates that that MI has a small positive effect on weight management and significant effect on BMI, total blood cholesterol and systolic blood pressure. In addition, MI might support long-term weight loss maintenance and was found to be a feasible intervention and appropriate for older adults with long-term medical conditions. However, there are still gaps in the litterature raising questions about the effectivness of MI. It is possible that MI is not as effective in some ethnic minority groups. In a study by Befort et al., obese African-American woman failed to improve outcomes after MI interventions. Armstrong et al. also raises the issue that the small data size makes it difficult to draw a conclusion, as only 11 studies were applicable for their meta-analysis, reducing the statistical power of the findings. Thus, more larger studies are required to draw a clear conclusion of the effectiveness of MI. In addition, more long-term studies are required to confirm the long-term effects of MI. What words to use when addressing excess weight with patients? As obesity is an increasing problem, physiotherapists needs to be able to address this topic in a sensitive and effective way, as there is a lot of stigma in relation to this topic. To avoid misinterpretation, physiotherapists need to be aware of terminology used to reduce the chances of damaging their relationship with the patient. What words would you have used/avoided? Spend a few minutes considering the different terms and find out which you think are accepted amongst patients, and what terms that are not. In the studies available, there is a consistency that the terms “weight” and “BMI” are the most desirable terms when raising the question about patient’s excess weight.) While the terms “excess fat”, “obesity”, “fatness”, “large size” and “heaviness” were found to be undesirable terms by participants. However, a study looking at patients’ reactions when their GP used the term “obesity” compared with euphemisms e.g., “Your weight might be damaging your health” found, interestingly, that the obese patients reacted more positively to the euphemisms than to the term “obesity”, while it was the opposite for non-obese patients. This suggests that different people react in different ways depending on their weight. Guidelines on terminology and communication styles would be beneficial to inform training for health care students. Research suggests that some words, "Weight" and "BMI" are better to use than others are when communicating with patients regarding their excess weight. Having in mind there is a huge variation of terms that people find reasonable, and asking the patient what terms they use might be helpful in order to avoid misinterpretation. May is a 41-year old woman. She works as a school receptionist, which is a demanding job, with long working hours. Her GP is concerned about her obesity (BMI: 34kg/m2) and borderline high blood pressure. She has 3 kids to take care of. She is worried that exercise programme will change her lifestyle habits and affect her family’s routine. 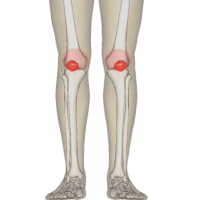 She complains of low back pain and slight pain in right knee during walking. She reports shortness of breath when taking long walks. She feels very tired at the end of the day. 1. List the problems May have. 2. What advice might you give her? 3. Which local activities could you refer her to? 4. Design and justify an exercise programme for May. Are there any precautions or contraindications you would take during the session? Take some time to think of your intervention for May before taking a look at the example recommendations below (see section 9). Physiotherapists have a major role in management of obese and overweight patients. Obesity and overweight is a current and concerning health issue as many people are affected by it. There are many contributing factors to obesity- socio-economic status, mental health and genetics being three of the largest factors. Communication can be used to facilitate behaviour change in people who are overweight and obese. Physiotherapists can make use of techniques like motivational interviewing to effectively make a difference. This resource was created for junior physiotherapists and other newly qualified health professionals to assist them in understanding overweight and obesity and using communication to effectively intervene with people with this condition. 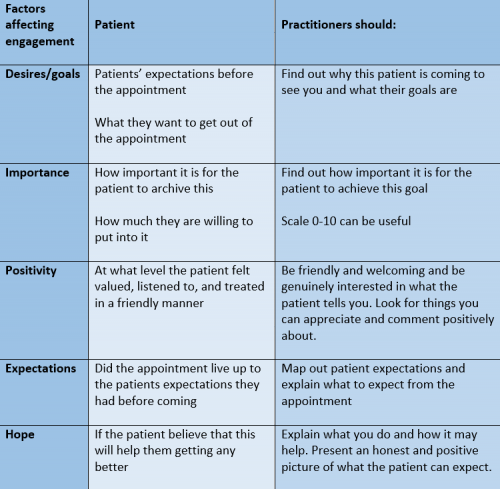 Users of this resource are encouraged to practice motivational interviewing techniques with patients, so that they can develop their communication skills and discover what approach is most effective with the patients they treat. Use this opportunity to reflect on what you have learned over the course of this learning activity- this can be used as a summary for your CPD record. Below are some questions you can use to guide your reflection. The following tables contain this resource's suggestions for the KSF model (from section 3.2) and the case study (from section 7). Please use these tables to compare your ideas with. Assessment tools or tests may need to be modified to people’s abilities- for example if range of movement is limited due to excess adipose tissues then the person may not be able to carry out certain movements required for a test, leading to inaccurate results. Palpation will be more difficult as surface anatomy will be under a layer of adipose tissue. Risks connected with larger weights need to be considered- e.g. will bariatric equipment be required for assessments or treatments to be carried out? Physiotherapists may need to monitor their own positioning and safety when carrying out assessments and treatments. Assistance from other therapists may be required. There are clear links between obese/ overweight people and increased body image problems. If a person has a poor body image, they may feel uncomfortable in the physiotherapy setting and physiotherapists should attempt to make every effort to make them as comfortable as possible. They can do this with reassurance, being aware of the surroundings and creating an atmosphere of non-judgement if possible. Be aware of additional risks associated with obese/ overweight patients including diabetes, increased falls risks, heart issues, respiratory issues etc. (see section 2.3). 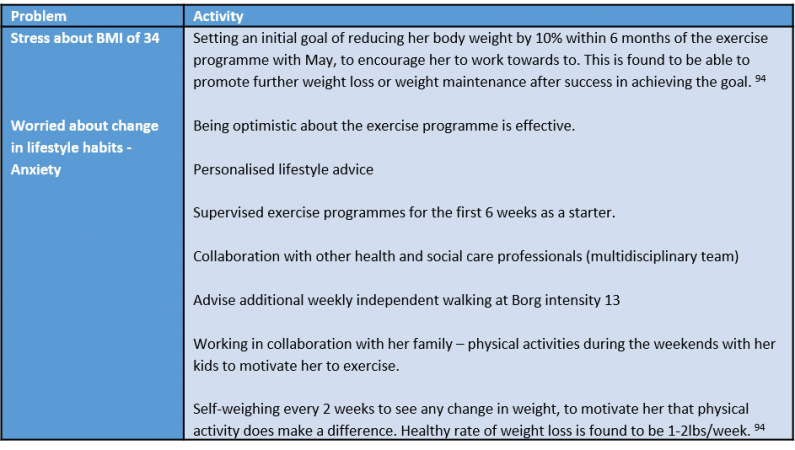 Use individual’s own goals and aims to shape treatment- for example help them to find a weight loss activity/ sport/ exercises that they will enjoy and will realistically be able to do and participate in. 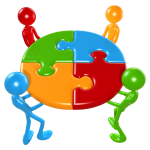 Work together with other professionals to achieve goals. ↑ World Health Organization. Controlling the global obesity epidemic. http://www.who.int/nutrition/topics/obesity/en/ (accessed 27 Jan 2016). ↑ Gill TP. Key issues in the prevention of obesity. British Medical Bulletin 1997; 53 (2): 359- 388. http://bmb.oxfordjournals.org/content/53/2/359.full.pdf (accessed 27 Jan 2016). ↑ Atherton JS. 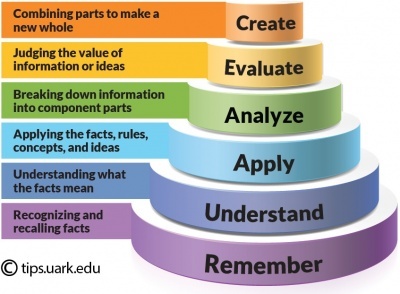 Bloom’s Taxonomy. Learning and Teaching 2013. http://www.learningandteaching.info/learning/bloomtax.htm (accessed 26 Jan 2016). ↑ 4.0 4.1 4.2 World Health Organization. Obesity and Overweight 2015. http://www.who.int/mediacentre/factsheets/fs311/en/ (accessed 10 Jan 2016). ↑ National Health Service. Obesity. http://www.nhs.uk/Conditions/Obesity/Pages/Introduction.aspx (accessed 24 Sept 2015). ↑ Bhurosy T, Jeewon, R. Pitfalls of using Body Mass Index (BMI) in assessment of obesity risk. Curr Res Nutr Food Sci 2013; 1(1): 71-76. http://www.foodandnutritionjournal.org/volume1number1/pitfalls-of-using-body-mass-index-bmi-in-assessment-of-obesity-risk/ (accessed 24 Jan 2016). ↑ Public Health England. Measurement of Obesity 2016. http://www.noo.org.uk/NOO_about_obesity/measurement (accessed 10 Oct 2016). ↑ 8.0 8.1 Keenan K, Grant I, Ramsay J. The Scottish Government. The Scottish Health Survey- Obesity. http://www.gov.scot/resource/doc/361003/0122058.pdf (accessed 29 Oct 2015). ↑ Fjeldstad C, Fjeldstad AS, Acree LS, Nickel KJ, Gardner AW. The influence of obesity on falls and quality of life. Dyn. Med. 2008; 7: 4. http://www.ncbi.nlm.nih.gov/pmc/articles/PMC2288598/ (accessed 29 Oct 2015). ↑ Public Health England. The impact of obesity. http://www.noo.org.uk/LA/impact (accessed 22 Sept 2015). ↑ 11.0 11.1 Chartered Society of Physiotherapy. Physiotherapy works: Obesity. http://www.csp.org.uk/professional-union/practice/your-business/evidence-base/physiotherapy-works/obesity (accessed 29 Oct 2015). ↑ Scottish Public Health Observatory. Obesity in Scotland: An epidemiology briefing 2007. http://www.scotpho.org.uk/downloads/scotphoreports/scotpho070925_obesityinscotland_rep.pdf (accessed 11 Oct 2015). ↑ Skleton JA, Cook SR, Auinger P, Klein JD, Barlow SE. Prevalence and Trends of Severe Obesity Among US Children and Adolescents. Academic Paediatrics 2009; 9 (5): 322- 329. http://www.sciencedirect.com/science/article/pii/S1876285909001090 (accessed 26 Jan 2016). 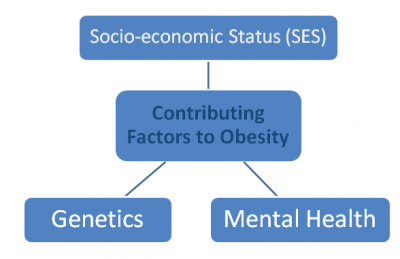 ↑ 15.0 15.1 Baum CL, Chou S. The Socio-Economic Factors of Obesity. Cambridge: National Bureau of Economic Research; 2011. http://www.nber.org/papers/w17423.pdf (accessed 5 Oct 2015). ↑ 16.0 16.1 16.2 National Obesity Observatory. Adult Obesity and Socioeconomic Status 2010. http://www.noo.org.uk/uploads/doc/vid_7929_Adult%20Socioeco%20Data%20Briefing%20October%202010.pdf (accessed 5 Oct 2015). ↑ Crawford D, Ball K. The role of socio-cultural factors in the obesity epidemic. In Crawford D, Jeffrey RW, Ball K, Brug J. Obesity Epidemiology: From aetiology to public health. Oxford: OUP 2010. p1- 19. ↑ Marwick A, Vaughan L, Ansari Z. Opposing socioeconomic gradients in overweight and obese adults. Australian and New Zealand Journal of Public Health 2013; 37 (1): 32- 38. http://eds.a.ebscohost.com (accessed 8 Oct 2015). ↑ Fehily A. Epidemiology of Obesity in the UK. In: British Nutrition Foundation. Obesity. Oxford: Blackwell Science Ltd. 1999. p23- 36. ↑ 20.0 20.1 20.2 20.3 20.4 National Institute for Health and Care Excellence. Obesity Prevention. http://www.nice.org.uk/guidance/CG43 (accessed 29 Oct 2015). ↑ Mental Health. Gov. What is mental health? http://www.mentalhealth.gov/basics/what-is-mental-health/ (accessed 11 Oct 2015). ↑ 22.0 22.1 22.2 22.3 Puhl RM, Heuer CA. The stigma of obesity: a review and update. Obesity 2009; 17 (5): 941- 964.http://onlinelibrary.wiley.com/doi/10.1038/oby.2008.636/full (accessed 7 Oct 2015). ↑ 23.0 23.1 Bogart WA. Regulating Obesity? Government, Society and Questions of Health; 2013. https://books.google.co.uk/books (accessed 8 Oct 2015). ↑ 24.0 24.1 24.2 24.3 Obesity Action Coalition. Understanding Obesity- Related Conditions. 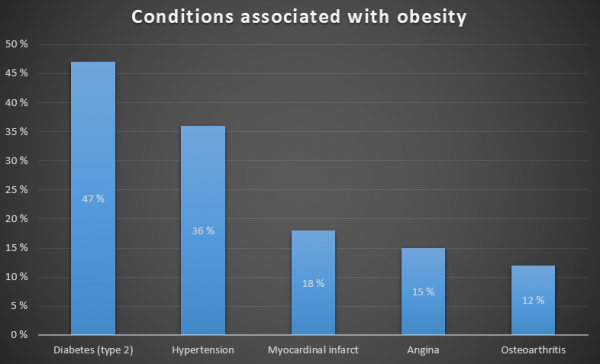 http://www.obesityaction.org/understanding-obesity/related-conditions (accessed 10 Oct 2015). ↑ 25.0 25.1 Luppino FS, deWit LM, Bouvy PF, Stijnen T, Cuijpers P, Pennix BWJH, Zitman FG. Overweight, Obesity and Depression: a systematic review and meta-analysis of longitudinal studies. Archives of General Psychiatry 2010; 67 (3): 220- 229. http://archpsyc.jamanetwork.com/article.aspx?articleid=210608 (accessed 8 Oct 2015). ↑ Sand AS, Emaus N, Lian O. Overweight and obesity in young adult women: A matter of health or appearance? International Journal of Qualitative Studies on Heath and Well-being 2015; 10: 29026. http://www.ijqhw.net/index.php/qhw/article/view/29026 (accessed 9 Jan 2016). ↑ Stunkard AJ, Faith MS, Allison KC. Depression and Obesity. Biological Psychiatry 2003; 54 (3): 330- 337.http://www.biologicalpsychiatryjournal.com/article/S0006-3223(03)00608-5/abstract (accessed 8 Oct 2015). ↑ Allison DB, Newcomer JW, Dunn AL, Blumenthal JA, Fabricatore AN, Daumit GL et al. 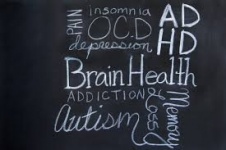 Obesity among those with mental disorders: a National Institute of Mental Health meeting report. Am J Prev Med 2009; 36 (4): 341- 350.http://www.ncbi.nlm.nih.gov/pubmed/19285199 (accessed 7 Oct 2015). ↑ Dennis M. Communication in the clinical mental health setting. In: Everett T, Dennis M, Ricketts E. Physiotherapy in Mental Health. Oxford: Butterworth- Heinemann 1995. https://books.google.co.uk/books?hl=en&lr=&id=QYLbAgAAQBAJ&oi=fnd&pg=PP1&dq=physiotherapy+and+mental+health&ots=lSiD8swL1F&sig=CQTS1QOYWwvRm5EWYfGVSEVfOdU#v=onepage&q=physiotherapy%20and%20mental%20health&f=false (accessed 19 Jan 2016). ↑ Walley AJ, Blakemore AIF, Froguel P. Genetics of obesity and the prediction of risk for health. Human Molecular Genetics 2006; 15 (2): R124- R130. http://hmg.oxfordjournals.org/content/15/suppl_2/R124.full (accessed 8 Jan 2016). ↑ National Health Service. Prader-Willi Syndrome. http://www.nhs.uk/Conditions/prader-willi-syndrome/Pages/Introduction.aspx (accessed 11 Oct 2015). ↑ Tenesa A, Campbell H, Theodoratou E, Dunlop L, Cetnarskyj R, Farrington SM, Dunlop MG. Common genetic variants at theMC4Rlocus are associated with obesity, but not with dietary energy intake or colorectal cancer in the Scottish population. International Journal of Obesity 2009; 33: 284- 288. ↑ Hawkins SS, Law C. A review of risk factors for overweight in preschool children: A policy perspective. International Journal of Pediatric Obesity 2006; 1 (4): 195- 209. http://onlinelibrary.wiley.com/doi/10.1080/17477160600943351/abstract (accessed 5 Oct 2015). ↑ Oken E, Levitan EB, Gillman MW. Maternal smoking during pregnancy and child overweight: systematic review and meta-analysis. International Journal of Obesity 2008; 32: 201- 210. http://www.nature.com/ijo/journal/v32/n2/full/0803760a.html (accessed 10 Oct 2015). ↑ Smith GD, Steer C, Leary S, Ness A. Is there an intrauterine influence on obesity? Evidence from parent-child associations in the Avon Longitudinal Study of Parents and Children (ALSPAC). Archives of Disease in Childhood 2009; 92 (10): 876- 880. http://www.ncbi.nlm.nih.gov/pmc/articles/PMC2083247/ (accessed 11 Oct 2015). ↑ Oken E. Maternal and child obesity: The casual link. Obstetrics and Gynecology Clinics of North America 2009; 36 (2): 361- 377. ↑ Sleddens EFC, Gerards SMPL, Thijs C, de Vries NK, Kremers SFPJ. General parenting, childhood overweight and obesity-inducing behaviors: a review. International Journal of Pediatric Obesity 2011; 6 (2): e12- e27.http://onlinelibrary.wiley.com/doi/10.3109/17477166.2011.566339/abstract (accessed 11 Oct 2015). ↑ Fitzpatrick SL, Wischenka D, Appelhans BM, Pbert L, Wang M, Wilson DK, Pagoto SL. An Evidence-based Guide for Obesity Treatment in Primary Care. The American Journal of Medicine 2016; 129 (1): 115.e1- 115.e7. http://www.amjmed.com/article/S0002-9343(15)00691-9/fulltext (accessed 26 Jan 2016). ↑ 39.0 39.1 39.2 SIGN. Management of Obesity. http://www.sign.ac.uk/guidelines/fulltext/115/index.html (accessed 29 Oct 2015). ↑ Fu Y, Griffin TM. Obesity, Osteoarthritis and Aging: The Biomechanical Links. In: Gefen A, Benayahu D, editors. Studies in Mechanobiology, Tissue Engineering and Biomaterials. Volume 16. Cham : Springer International Publishing : Imprint: Springer, 2015.http://link.springer.com/book/10.1007%2F978-3-319-09336-9 (accessed 29 Oct 2015). ↑ Wearing SC, Hennig EM, Byrne NM, Steele JP, Hills AP. The Biomechanics of restricted movement in adult obesity. 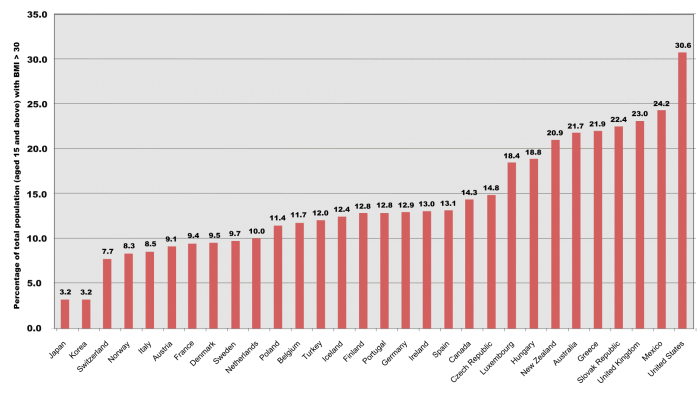 Obesity Reviews 2006; 7 (1): 13- 24. http://resolver.ebscohost.com (accessed 16 Dec 2015). ↑ De Guia N, Zhu N, Keresteci M, Shi JE. 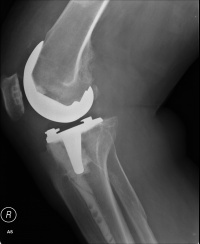 Obesity and joint replacement surgery in Canada: Findings from the Canadian Joint Replacement Registry (CJRR). Healthcare Policy 2006; 1 (3): 36- 43. http://www.ncbi.nlm.nih.gov/pmc/articles/PMC2585344/ (accessed 12 Dec 2015). ↑ Canadian Physiotherapy Association. Physiotherapists and the management of obesity. Ontario: Canadian Physiotherapy Association 2007. http://www.physiotherapy.ca/public (accessed 12 Dec 2015). ↑ 44.0 44.1 44.2 You L, Sadler G, Majumdar S, Burnett D, Evans C. Physiotherapists’ Perceptions of Their Role in the Rehabilitation Management of Individuals with Obesity. Physiotherapy Canada 2012; 64 (2):168– 175. http://www.ncbi.nlm.nih.gov/pmc/articles/PMC3321996/pdf/ptc-64-168.pdf (accessed 29 Oct 2015). ↑ 45.0 45.1 45.2 45.3 45.4 45.5 Alexander E, Rosenthal S, Evans C. Achieving Consensus on Recommendations for the Clinical Management of Overweight and Obese Adults for Canadian Physiotherapy Practice. Physiotherapy Canada 2012; 64 (1): 42- 52. http://www.ncbi.nlm.nih.gov/pmc/articles/PMC3280708/pdf/ptc-64-042.pdf (accessed 13 Oct 2015). ↑ 46.0 46.1 46.2 46.3 46.4 46.5 46.6 Grave RD, Calugi S, Centis E, El Ghoch M, Marchesini G. Cognitive-Behavioral Strategies to Increase the Adherence to Exercise in the Management of Obesity. Journal of Obesity 2010; 1 (1): 1- 11. http://www.hindawi.com/journals/jobe/2011/348293/ (accessed 28 Oct 2015). ↑ Mauro M, Taylor V, Wharton S, Sharma AM. Barriers to Obesity Treatment. European Journal of Internal Medicine 2008; 19 (3): 173- 180. http://www.sciencedirect.com/science/article/pii/S0953620507002701 (accessed 12 Jan 2016). ↑ 48.0 48.1 48.2 Hamdy O, Uwaifo GI, Oral EA. Obesity treatment and management – behavioural changes. Medscape 2015. http://emedicine.medscape.com/article/123702-treatment#d16 (accessed 6 Jan 2015). ↑ Konrad TR, Link CL, Shackelton RJ, Marceau LD, von dem Knesebeck O, Siegrist J et al. It’s about time: Physicians’ perceptions of time constraints in primary care medical practice in three national healthcare systems. Medical care 2010; 48 (2): 95- 100. http://www.ncbi.nlm.nih.gov/pmc/articles/PMC3621071/ (accessed 12 Jan 2016). ↑ Monsen KA, Attleson IS, Erickson KL, Neely C, Oftedahl G, Thorson DR. Translation of Obesity Practice Guidelines: Interprofessional Perspectives Regarding the Impact of Public Health Nurse System-Level Intervention. Public Health Nursing 2014; 32 (1): 34- 42. http://www.ncbi.nlm.nih.gov/pmc/articles/PMC4415163/ (accessed 12 Jan 2016). ↑ 51.0 51.1 51.2 Setchell J, Watson B, Jones L, Gard M. Weight stigma in physiotherapy practice: Patient perceptions of interactions with physiotherapists. Manual Therapy 2015; 20 (6): 835- 841. http://www.sciencedirect.com/science/article/pii/S1356689X15000703 (accessed 12 Jan 2016). ↑ Trede F. Emancipatory Physiotherapy Practice. Physiotherapy Theory and Practice: An International Journal of Physiotherapy 2012; 28 (6): 466- 473. http://www.tandfonline.com/doi/full/10.3109/09593985.2012.676942 (accessed 12 Jan 2016). ↑ NHS Scotland. Knowledge and Skills Framework Guidance. http://www.ksf.scot.nhs.uk/ (accessed 29 Oct 2015). ↑ Xcite. 1st Steps to Health and Wellbeing. http://www.lothianstrokemcn.scot.nhs.uk/community/West%20Lothian%20Documents/1st%20STEPs.pdf (accessed 26 Jan 2016). ↑ Poobalan AS, Aucott LS, Smith WCS, Avenell A, Jung R, Broom J. Long-term weight loss effects on all cause mortality in overweight/obese populations. Obesity Reviews 2007; 8 (6): 503- 513. http://onlinelibrary.wiley.com/doi/10.1111/j.1467-789X.2007.00393.x/full (accessed 12 Jan 2016). ↑ McManamon R. Practical Weight Management in Primary Care. Journal of Community Nursing 2015; 29 (4): 75- 78. http://eds.a.ebscohost.com (accessed 12 Jan 2016). ↑ Hobbs L, Campbell R, Hildon Z, Michie S. Behaviour change theories across psychology, sociology, anthropology and economics: a systematic review. Psychology and Health 2011; 26 (2): 31. http://eds.a.ebscohost.com (accessed 27 Oct 2015). ↑ 58.0 58.1 58.2 Michie S, Johnston M. Theories and techniques of behaviour change: Developing a cumulative science of behaviour change. Health Psychology Review 2012; 6 (1): 1- 6. http://www.tandfonline.com/doi/pdf/10.1080/17437199.2012.654964 (accessed 29 Oct 2015). ↑ 59.0 59.1 59.2 59.3 59.4 59.5 59.6 59.7 59.8 Foster GD, Makris AP, Bailer BA. Behavioural treatment of obesity. The American Journal of Clinical Nutrition 2005; 8 (1): 2305- 2355. http://ajcn.nutrition.org/content/82/1/230S.full (accessed19 Dec 2015). ↑ AHEAD Research Group. Long Term Effects of a Lifestyle Intervention on Weight and Cardiovascular Risk Factors in Individuals with Type 2 Diabetes: Four Year Results of the Look AHEAD Trial. Arch. Int. Med. 2010; 170 (17): 1566- 1575. http://archinte.jamanetwork.com/article.aspx?articleid=226013 (accessed 18 Dec 2016). ↑ 62.0 62.1 Pearson, E.S. Goal setting as a health behaviour change strategy in overweight and obese adults: a systematic literature review examining intervention components. Patient Education and Counselling 2012; 87: 32-42. http://ac.els-cdn.com/S0738399111003855/1-s2.0-S0738399111003855-main.pdf?_tid=4ee467ca-c5de (accessed 22 January 2016). ↑ 63.0 63.1 Adamson AJ, Benelam B. From awareness to action: Can knowledge about what constitutes a healthy diet and lifestyle be translated into sustainable behaviour change? Nutrition Bulletin 2013; 38 (1): 1- 4. http://onlinelibrary.wiley.com/enhanced/doi/10.1111/nbu.12001/ (accessed 26 Oct 2015). ↑ 64.0 64.1 Watson R, Wyness L. Don’t tell me what to eat- Ways to engage the population in positive behaviour change. Nutrition Bulletin 2013; 38 (1): 23- 29. http://eds.a.ebscohost.com (accessed 27 Oct 2015). ↑ Diabetes Prevention Program Research Group. Reduction in the incidence of type 2 diabetes with lifestyle interventions or metformin. The New England Journal of Medicine 2002; 346 (6): 393 – 403. http://www.nejm.org/doi/full/10.1056/NEJMoa012512 (accessed 5 January 2016). ↑ Michie S., Stralen, M.M. and West, R. The behaviour change wheel: a new method for characterising and designing behaviour change interventions. Implementation Science 2011; 6 (42): 1 – 11. http://www.implementationscience.com/content/6/1/42 (accessed 26 January 2016). ↑ 67.0 67.1 Atkins L, Michie S. Changing eating behaviour: What can we learn from behavioural science? Nutrition Bulletin 2004; 38 (1): 30- 35. http://onlinelibrary.wiley.com/doi/10.1111/nbu.12004/pdf (accessed 10 Dec 2015). ↑ Michie, S. and Abraham, C. Interventions to change health behaviours: evidence based or evidence-inspired? Psychology and Health 2004; 19 (1): 29 – 49. http://eds.b.ebscohost.com (accessed 22 January 2016). ↑ Cambridge Dictionaries Online. Ambivalent. http://dictionary.cambridge.org/dictionary/english/ambivalent (accessed 26 Jan 2016). ↑ 70.00 70.01 70.02 70.03 70.04 70.05 70.06 70.07 70.08 70.09 70.10 70.11 70.12 70.13 70.14 70.15 70.16 70.17 70.18 70.19 Miller WR, Rollnick S. Motivational Interviewing: helping people change. London/New York: the Guilford Press, 2013. ↑ 71.0 71.1 Lindhart CL, Rubak S, Mogensen O, Hansen HP, Goldstein H, Lamont RF, Joergensen JS. Healthcare professionals experience with motivational interviewing in their encounter with obese pregnant women. Midwifery 2015; 31(7): 678-684. http://www.sciencedirect.com/science/article/pii/S0266613815000960 (accessed 27 Jan 2016). ↑ 72.0 72.1 72.2 72.3 Armstrong MJ, Mottershead TA, Ronksley PE, Sigal, RJ, Campbell TS, Hemmelgarn BR. Motivational interviewing to improve weight loss in overweight and/or obese patients: a systematic review and meta-analysis of randomized controlled trials. Obesity Review 2012; 12(9):709-723. http://www.ncbi.nlm.nih.gov/pubmed/21692966 (accessed 27 Jan 2016). ↑ 73.0 73.1 73.2 73.3 73.4 73.5 73.6 73.7 Campos C. Tips for Communication with Overweight and Obese Patients. Journal of family practice 2014;63(7):11-14. http://www.tipher.com/downloads/management_obesity_adults_july2014.pdf (accessed 21 Jan 2016). ↑ Kimberly AG, Bennett WL, Cooper LA, Bleich SN. Patients who feel judged about judged about their primary care providers. Patient Education and Counseling 2014;97(1):128-131. ↑ Wong EMY, Cheng MMH. Effects of motivational interviewing to promote weight loss on obese children. Journal of Clinical Nursing 2013;22(17-18):2519-2530. http://onlinelibrary.wiley.com/doi/10.1111/jocn.12098/abstract;jsessionid=77e92290589451908f8956b3efab4db1.f03t04 (accessed 21 Jan 2016). ↑ 76.0 76.1 76.2 Chadwick P, Sacher P, Swain C. Talking to families about overweight children. British Journal of School Nursing 2008;3(8):271-6. [online]. http://www.magonlinelibrary.com/doi/abs/10.12968/bjsn.2008.3.6.31696 (accessed 21 Jan 2016). ↑ Lundahl BW, Kunz C, Brwonell C, Tollefson D, Burke BL. Meta-analysis of motivational interviewing: twenty-five years of empirical studies. Research on Social Work Practice 2014;20(2):137-160. ↑ Rubak S, Sandbæk A, Lauritzen T, Christensen B. Motivational interviewing: a systematic review and meta-analysis. British Journal of General Practice 2005;55(513):305-212. [online]. http://bjgp.org/content/55/513/305.long (accessed 21 Jan 2016). ↑ Simpson SA, Mcnamara R, Shaw C, Kelson M, Moriarty Y, Randell E, Cohen D, Alam MF, Copeland L, Duncan D, Espinasse A, Gillespie D, Hill A, Tapper EOJK, Townson J, Williams S, Hood K. A feasibility randomised controlled trial of a motivational interviewing-based intervention for weight loss maintenance in adults. 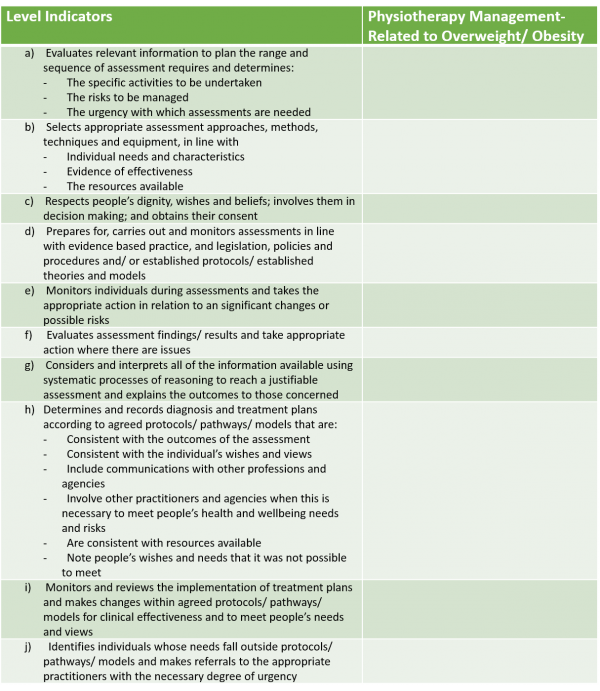 Health Technology Assessment 2015;19(50)1-408 [online]. vol. 19, no. 50, pp. 1-408. http://www.journalslibrary.nihr.ac.uk/__data/assets/pdf_file/0011/148196/fullreport-hta19500.pdf. (accessed 21 Jan 2016). ↑ Cummings SM, Cooper RL, Cassie KM. Motivational interviewing to affect behavioural change in older adults. Research on social work practice 2009;19(2):195-204. http://www.scie-socialcareonline.org.uk/motivational-interviewing-to-affect-behavioral-change-in-older-adults/r/a1cg0000000gziemag (accessed 21 Jan 2016). ↑ Befort CA, Nollen N, Ellerbeck EF, Sullican, D.K, Thomas, JL, Ahluwalia JS. Motivational interviewing fails to improve outcomes of a behavioral weight loss program for obese african american women: a pilot randomized trial. Journal of Behavioral Medicine 2008;31(5):367-377. http://link.springer.com/article/10.1007%2fs10865-008-9161-8 (accessed 27 Jan 2016). ↑ 82.0 82.1 82.2 Volger S, Vetter, ML, Doughterty M, Panigrahi E, Egner R, Webb V, Thomas JG, Sarwer DB, Wadden TA. Patients’ preferred terms for describing their excess weight: discussing obesity in clinical practice. Obesity (Silver Spring) 2012;20(1):147-150. ↑ 83.0 83.1 Wadden TA, Didie E. What’s in a name? Patients’ preferred terms for describing obesity. Obesity Research 2003;11(9):1140-6. ↑ 84.0 84.1 Dutton GR, Tan F, Perri MG, Stine CC, Dancer-Brown M, Goble M, Vessem NV. What Words Should We Use When Discussing Excess Weight? Journal of the American Board of Family Medicine 2010;23(5)606-613. http://www.jabfm.org/content/23/5/606.full (accessed 21 Jan 2016). ↑ 85.0 85.1 85.2 Swift JA, Choi E, Puhl RM, Glazebrook C. Talking about obesity with clients: preferred terms and communication styles of uk pre-registration dieticians, doctors, and nurses. Patient education and counseling 2013;91(2)186-191. http://www.sciencedirect.com/science/article/pii/s0738399112005216 (accessed 21 Jan 2016). ↑ Taylor A, Ogden J. Avoiding the term ‘obesity’: an experimental study of the impact of doctors’ language on patients’ beliefs. Patient Educational Counseling 2009;76(2)260-4. http://www.1ncbi.nlm.nih.gov/pubmed/19167856 (accessed 21 Jan 2016). ↑ Glynn A, Fiddler H. The Physiotherapist’s Pocket Guide to Exercise: Assessment, Prescription and Training 2009: 204-205. ↑ Carucci LR. Imaging obese patients: problems and solutions. Abdominal Imaging 2012; 38 (4): 630- 646. http://link.springer.com/article/10.1007%2Fs00261-012-9959-2 (accessed 12 Jan 2016). ↑ Hignett S, Griffiths P. Risk factors for moving and handling bariatric patients. Nursing Standard 2009; 24 (11): 40- 48. http://eds.a.ebscohost.com (accessed 12 Jan 2016). ↑ Schwartz MB, Brownell KD. Obesity and Body Image. Body Image 2004; 1 (1): 43- 56. http://www.sciencedirect.com/science/article/pii/S174014450300007X (accessed 29 Oct 2015). ↑ Public Health England. Obesity and Disability: Adults 2013. http://www.noo.org.uk/uploads/doc/vid_18474_obesity_dis.pdf (accessed 29 Oct 2015). ↑ 92.0 92.1 National Obesity Observatory. Obesity and Mental Health 2011. http://www.noo.org.uk/uploads/doc/vid_10266_Obesity%20and%20mental%20health_FINAL_070311_MG.pdf (accessed 5 Oct 2015). ↑ Nowicki T, Burns C, Fulbrook P, Jones J. Changing the mindset: An inter-disciplinary approach to management of the bariatric patient. Collegian 2009; 16 (4): 171- 175. http://www.sciencedirect.com/science/article/pii/S1322769609000250 (accessed 12 Jan 2016).